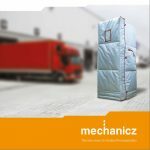 Mechanicz – thermal covers for foodstuff transportation. Made in Velikiy Novgorod. Comments Off on Mechanicz – thermal covers for foodstuff transportation. Made in Velikiy Novgorod.